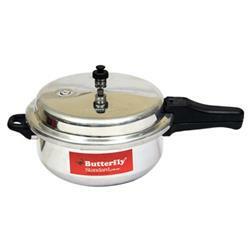 Butterfly Aluminium Pressure Cooker many safety features such as strongly built with thick walls, Handles considered for firmer grip and a gasket vent release system decrease the risk of kitchen accidents and guarantees that you can make hassle-free meals. It comes with superiority fittings and a smart Aluminium body. Its International styling mixes in to any kitchen and carries worth food.